Personalised Christmas Fortune Cookies are a popular alternative to our standard range of promotional fortune cookies. Our Christmas Fortune Cookies have a Christmas cracker style of joke printed on one side of the message slip. We can then print your own text and / or logo on the reverse of the slip to create your own bespoke Christmas cookies. 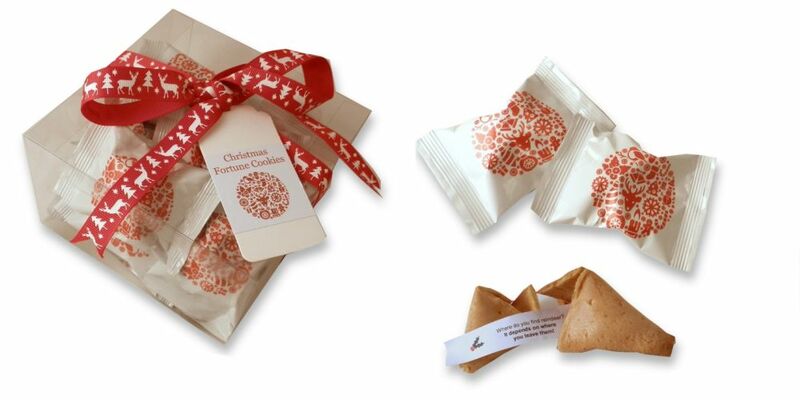 Wrappers: Our Christmas Fortune Cookies are individually wrapped in white foil with a stylish red festive design. Alternatively we can wrap your fortune cookies in wrappers printed with your own branding. Quantity: The minimum quantity for personalised fortune cookies is just 300. We can supply your personalised Christmas Fortune Cookies in gift boxes. We can also supply individual mailing boxes for your Christmas fortune cookies. For further details and costs please complete the form below and we will come straight back to you. If you would like to contact us in the meantime please don't hesitate to drop us an email - enquiries@ifortunecookies.co.uk or call us: 0845 370 7252.